Do you ever wonder how long your jewelry will last before it starts to wear? It’s important to know how long a piece can be expected to last. A lot of that starts with the type of jump rings, or wire, you use. Solid metals don’t have a coating that can wear off, but they are often much more expensive and are able to tarnish. With solid metals you’re also limited by the colors of the actual metal. Coated, plated, filled, and anodized wire solve many of these issues. Gold Filled and Silver Filled wires allow you to work with precious metals at a much more reasonable cost. Non-Tarnish wire allows you to work with solid metal without having to worry about it tarnishing or oxidizing. Enamel Coated Copper and Anodized Aluminum wire come in every color imaginable. Anodized Niobium and Titanium are colorful and strong hypoallergenic metals that I absolutely adore. With the benefits of coated, plated, and enameled wire come the downside of the coating eventually wearing off. 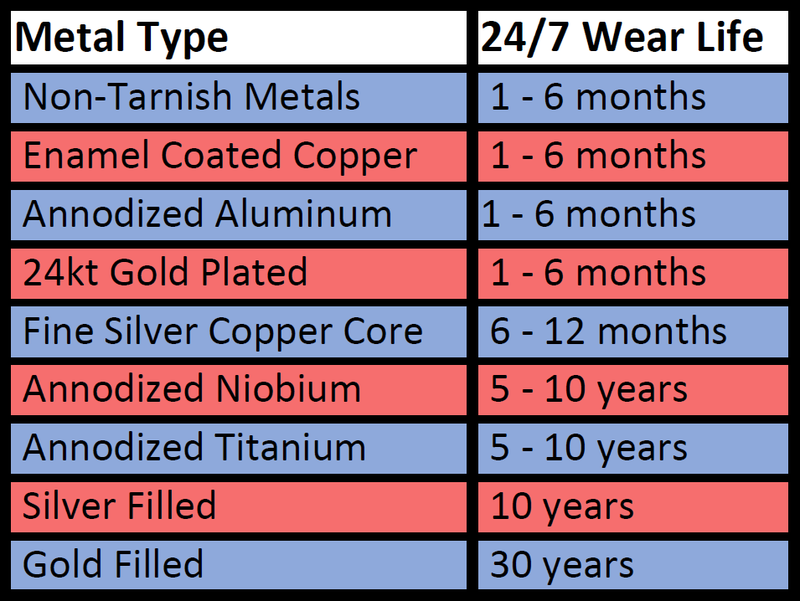 With 24/7 wear you can expect these coatings to last between 1-6 months. Fine silver copper core lasts a little longer because of a thicker coating. Gold and Silver Filled wire has a much much thicker coating than plated metal, and might go your whole life without wearing through. Gold Filled wire lasts longer than Silver Filled because it is a more durable metal. You can use this chart to estimate how long the wire and jump rings you buy from my store will last. These numbers are based on 24/7 wear in a bracelet. The lifetime will increase with less frequent wear, or in jewelry exposed to less abrasion, such as earrings. These are worst case scenario numbers because few people actually wear jewelry 24/7. In reality your numbers should be higher than these. I’m assuming that for the non-tarnish metal, the coating simply wears off after time? The metal underneath would still be solid though right? Assuming it was brass or copper…. Yes, you are correct. The base metal for enameled jump rings is copper. The structure of the jump ring, clasp or ear wire is not changed, just the outward appearance. Interesting this is something that is good to know. Hi. I have bought several items from you in the past and have to say that even though they were from your budget , best value range, they were surprisingly durable, unlike other suppliers I had previously used. Your honest descriptions of your items was extremely useful and ment I knew exactly what I was getting. Never underestimate how much your customers appreciate the honesty and help you give us all. Thanks again for another useful tip. Great information! Thank you for your fabulous gift of your newsletter!! It is so tempting to use plated items at times because of the availability, low cost and even nice appearance of some of the “coatings”. If the world was actually the place I like to imagine it one day will be, suppliers would list an honest “life expectancy” of their coated products. Thank you for being the honest soul who actually puts numbers in place of the ??. It amazes me the ranges that your knowledge covers! Again for being such a bright light and sharing the voice of your experience with us. Amazing too that with the size of your business you still never fail to answer each of our endless questions personally with patience and clarity!!!! Kudos to you Ralph for following your calling as a guide and teacher. Thank you so much for disclosing such valuable information. I use silver filled wire as I am still working on my wire working skills but want to give customers a good piece of jewelry. I’ve placed my first order and I believe I will be back for more. Could you please clarify the benefits of usin Sterling silver chain versus steel or silver plated. Thanks! Beyond color matching to whatever other findings you use with your jewelry, it really is personal preference and availability that dictates whether you use stainless steel or sterling silver. You can use silver plated chains as well, but due to the plated nature they will not last as long as the other options. This is literally one of the best jewelry stores I’ve ever encountered. I’m only saying it’s one of the best because I’m sure there are others who I haven’t discovered yet. Just thank you for doing such a great job! This is very useful information I’ve had a hard time finding elsewhere!